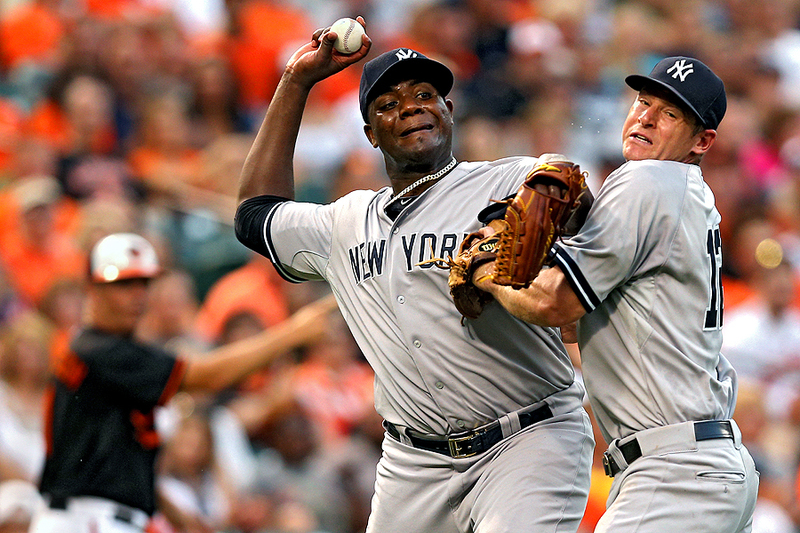 "Starting pitcher Michael Pineda #35 of the New York Yankees collides with teammate third baseman Chase Headley #12 as he tries to throw out Jimmy Paredes #38 of the Baltimore Orioles in the third inning at Oriole Park at Camden Yards on June 12, 2015 in Baltimore, Maryland." Baseball is a game odds. To start, there are at any given time ten players on diamond - nine defensive players and a batter. Add a couple base runners and there can be up to thirteen. The problem with that, is one can only focus one place at any given time. To shoot the pitcher throwing, then the batter hitting and then the diving catch at shortstop all in one play is near impossible. One must decide where to focus the lens during each at bat - rolling the dice - playing the odds. The game is also one of solidarity. Lots of action of one player doing one thing - throwing, hitting, pitching, catching, sliding, or reacting to a play. So when there are two or more players in any given rectangle of space, where a photographer is correctly gambling to be, it's a nice surprise. When pitcher Michael Pineda #35 of the New York Yankees collided with a teammate after a bunt, I knew it would be a compelling picture and glad I had decided to stick with the pitcher as three players merged on the ball.